Kabaya, a producer of confectionery in the city of Okayama near Hiroshima, has come out with a series that is bound to be a smashing hit: Japanese heroes of the Warring States Period (Sengoku Jidai,1467-1568) created by figure designer Akihiro Enku. The series consists of six historical characters who played important roles in Japan’s unification, and two famous swordsmen. The figures are exquisitely made with amazing attention to detail. Figures carry swords and other weapons, and have very realistic expressions on their faces. You can actually feel the structure of their armor. It is quite rare that historical figures are used. More common are famous Japanese characters like Doraemon, animals, or the robots that figure in Science Fiction Anime. In Japan it is usually not the small kids that buy these collectables, but teenagers and adults. Once an item has become hot, prices at auctions can go sky high. The latest collection craze for an o-make was Furuta Seika’s Choco Egg. Small chocolate eggs that held animal figurines designed by Japan’s top figure designer Shinobu Matsumura of Kyoto-based Kaiyodo. Within half a year they sold 7 million eggs. The craze took Japan by storm. There were Choco Egg specialty stores, Choco Egg Encyclopedias, stickers and fan web sites. A lot of Choco Egg trading took place at Yahoo’s Japanese auction site. Some figures sold for as much as JYE 50,000 (about USD 420.00 at the time)! A highly gifted military leader, ruthless warrior, and one of the three people that unified Japan (The others were Toyotomi and Tokugawa). 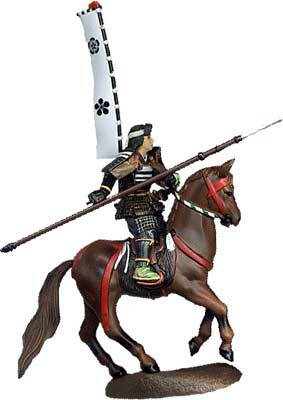 Emerged at the battle of Sekigahara (1600) as the final winner to unify Japan. Founded the Tokugawa Shogunate, which ruled Japan for over 260 years. Fought for Oda Nobunaga, and later assisted Hideyoshi with the invasion of Korea. Maeda tried to curb the power of Tokugawa, but died before Sekigahara. Traditionally considered the strongest warrior of the Warring States Period. His motto: Be as swift as the wind, silent as wood, fierce as fire, composed as a mountain. Charismatic lord, whose dream of unifying Japan was destroyed when his forces were defeated by Takeda in a dramatic battle in Nagano (location of the 1998 Winter Olympics). The most famous swordsman of Japanese history. Won 60 bouts, and lost none. In his Book of Five Rings he claimed that training the spirit is more important than skill. Swordsman, famous for his technique and long sword. Fought Miyamoto in 1612. It is said Miyamoto carved a sword from an oar to overcome the long sword. Sazaki lost. I was wondering if there was anyplace that sold/auctioned the entire collection.